The Arunachal Pradesh Public Service Commission was established on 4th April' 1988 under Article 315 of the Indian Constitution. The Commission consists of a Chairman, two members and a secretary. 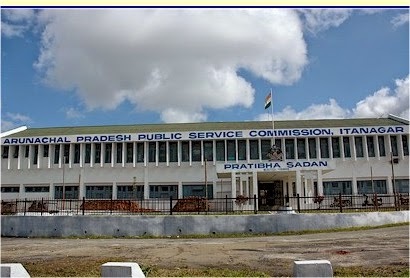 The office of the Arunachal Pradesh Public Service Commission is situated at PSC building, Vidhan Vihar, Itanagar, the capital city of Arunachal Pradesh. The Head of the Office of the Commission is the Secretary who is appointed by the Commission with prior approval of the Governor. The Secretary is assisted by a Deputy Secretary. Below to their ranks, there are 2(two) Under Secretaries. The number of Section Officers under the Commission is 3(three). About 30(thrity) other officers including Senior Personal Assistants, Personal Assistants, Assistants, Lower Divisional Clerks, Upper Divisional Clerks, Typists, Peons etc. are also assisting the Commission in its functions.